Wasps were beaten 31-13 by a clinical Saracens side in the Premier 15s semi-finals. Wasps worked tirelessly but the home side pulled away in the second half. Despite being on top for large parts of the first half, the visitors went in behind and fell foul of the officials in the second period. Before the game a moving tribute was made to Wasps FC Vice President and former player, Roger Skinner, who sadly passed away last week. Wasps started brightly, building phases in the Saracens 22m, but progress was halted through an intervention from the assistant referee. Claudia Macdonald saw an early yellow card as she tried to break free after being held off the ball by a Saracens player, but judged to have illegally used the boot. The visitors defended valiantly and continued to control territory and possession for large swathes of the yellow card period. With a number of penalties in their favour, including a high tackle on Kate Alder which was lucky to escape further sanction, Wasps were unable to turn their early pressure into points. Saracens proved clinical, with two scores in quick succession seemingly out of nowhere. The first saw Jodie Rettie score under the posts, before Lotte Clapp got the second in the corner. 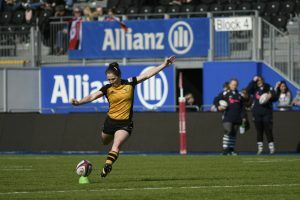 Wasps worked themselves back into the game with two well struck penalties from fly-half Lizzie Goulden late in the first half. They found themselves going in 12-6 behind, despite having the better of the possession in the first half but unable to convert. The home side came out stronger in the early exchanges in the second half, with an early try from Poppy Cleall. Wasps had to weather a storm of Saracens pressure for large periods of the second half, and fought continually to keep the hosts out. However, the penalty count continued to build against the visitors and eventually the pressure told. Saracens scored twice either side of the hour mark, through Hannah Botterman and Rosie Galligan, to put the game out of reach. However, Wasps showed their true spirit by continuing to defend and demonstrate their attacking flair, and got some reward for their endeavours with a late score. Hannah West was initially held up going close to scoring, but from the resulting scrum Louise Dodd smashed her way through the Saracens defence to score. The game came to a conclusion shortly after with the final score 31-13. Wasps will undoubtedly be disappointed with the result, but will take pride in the commitment and dedication they showed throughout the game. 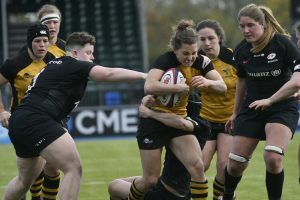 Despite the scoreline, Wasps showed glimpses of what an impressive outfit they are, with Lizzie Goulden pulling the strings on a dangerous backline, and a ferocious and unrelenting defensive effort from the entire squad. The players will now get a well-deserved break after a fantastic season by all those in black and gold, before coming right back to pre-season to go again for the 2019-20 Premier 15s season.